4HS-CR system, Fountain region. On the 16th of September at 21:50 EVE Standard Time, a The-Culture [-T C-] dreadnought force was dispatched by a Goonswarm Federation [CONDI] fleet in the system. The battle was prompted by Fountain Core having reinforced a The-Culture tower in the I-CUVX system the previous day. With the tower situated on a valuable moon, both sides were prepared to contest it. In order to defend the tower, The-Culture and its allies ChaosTheory. [KOS] assembled a 110 pilot Proteus strategic cruiser fleet, with Northern Coalition. [NC] bringing a similar composition with 90 pilots. Against this, Fountain Core was forced to rely on Goonswarm Federation to supply the mainstay of the fleet, a 160 pilot Machariel battleship fleet with a robust electronic warfare wing. Fountain Core itself brought a small Rattlesnake battleship fleet, estimated at around 30 pilots. As the tower exited its reinforced mode, The-Culture was able to bring in a few force auxiliary ships into the system to restore the shields. However, before it could repair enough of the damage, Goonswarm Federation forces bridged into the system, landing on the tower grid near the ships themselves. A few moments later, the Fountain Core force warped near the Machariel fleet as well, forcing the force auxiliary ships under the tower’s shields. By this point, The-Culture Proteus fleet arrived in the system and warped at close range to the Machariel fleet, landing only 50 kilometers away. The two fleets quickly anchored up and exchanged fire, starting the actual fight. The initial engagement proved bloody. The-Culture’s fleet had a hard time breaking the tank of the battleships, thanks to the amount of electronic warfare present on the field. Instead, it was forced to clear support and tackle, focusing on Crucifier and Maulus frigates as well as on interdictors. On the Goonswarm Federation side, the battleships were able to crack the tough armor of the strategic cruisers, though The-Culture’s logistics wing fought hard to save every ship. As the exchange wore on, reports came in of the incoming Northern Coalition. fleet. With the shift in the numerical advantage going to The-Culture’s side, Goonswarm Federation decided to withdraw. The-Culture was not having any of it, and decided to pursue, leaving the field to Fountain Core forces to hold, which promptly targeted and removed the tower in the absence of resistance, claiming it and securing the strategic victory. As this was going on, The-Culture and Goonswarm Federation continued a bitter skirmish that unfolded over several systems, as the latter continued to evade to former, seemingly retreating towards its holdings in the Delve region. Finally, the Machariel fleet looked to be cornered in the 4HS-CR system on the KVN-36 gate as Northern Coalition. and The-Culture fleets descended upon it. A second battle flared up, with both sides exchanging losses as the 3 fleets tangled up in a close range melee. Artillery barrages were answered by laser fire and super heated plasma charges, and ships on both sides caved in to the relentless firestorm. After a brief exchange and with the battleships unable to hold under the remorseless hammering, Goonswarm Federation quickly lit a cynosural beacon and brought in force auxiliaries in order to help it tank the incoming damage. At that point, The-Culture made a mistake. Its scouts had failed to report on the movement of Goonswarm Federation super capitals, which were moving in range of the fight. Unaware of the build up of reinforcements, The-Culture decided to commit a squadron of dreadnoughts to the field in order to remove both the battleships and their force auxiliary support. A second cynosural beacon went up, lit by The-Culture this time and allowing its capitals to enter the field. With The-Culture’s capitals on the field and committed, Goonswarm Federation sprang its trap and immediately jumped in its reinforcements; an entire super capital wing. As the supercarriers and titans hit the grid, doomsday weapons were fired and swarms of fighters unleashed. In just a few moments, most of The-Culture’s dreadnoughts were reduced to smoldering wreckage, and attention shifted to the remaining sub-capitals. Yet, there remained some luck on The-Culture’s side. The long skirmish had exhausted most of the Machariels’ tackle wing, allowing most of the strategic cruisers to flee the system with only a few caught and easily dispatched by the Goonswarm Federation fleet. The survivors retreated back to their respective staging systems, allowing Goonswarm Federation and its allies to claim both a strategic as well as a tactical victory. With the field secured, Goonswarm Federation forces safely extracted, ending the long and bloody fight. Battle report for the I-CUVX and 4HS-CR systems can be found here. All told the battle in its various parts lasted 40 minutes. I-CUVX hosted an estimated 300 pilots at the peak of the fighting, and 4HS-CR hosted 400. Time Dilation was present briefly, spiking in 4HS-CR system to nearly 40% before subsiding. The-Culture and its allies lost 49 ships including 12 dreadnoughts, 2 force auxiliary and 18 strategic cruisers for a total of 62.81 billion ISK. 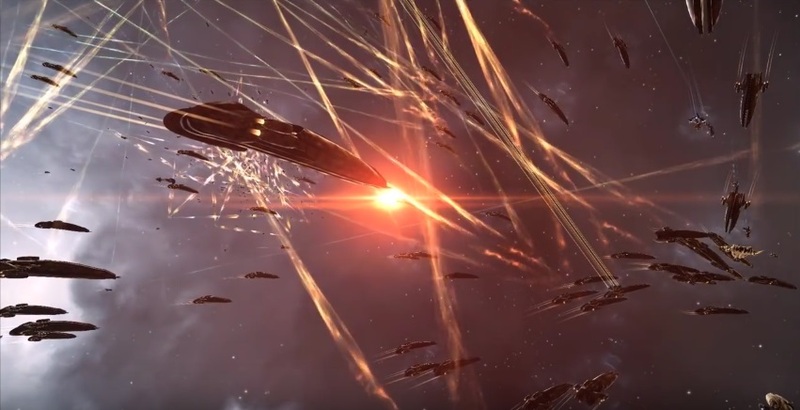 Goonswarm Federation and its allies lost 46 ships, including 1 force auxiliary and 15 battleships for a total of 15.1 billion ISK. new to me. Anyways, I’m definitely pleased I came across it and I’ll be bookmarking it and checking back often!